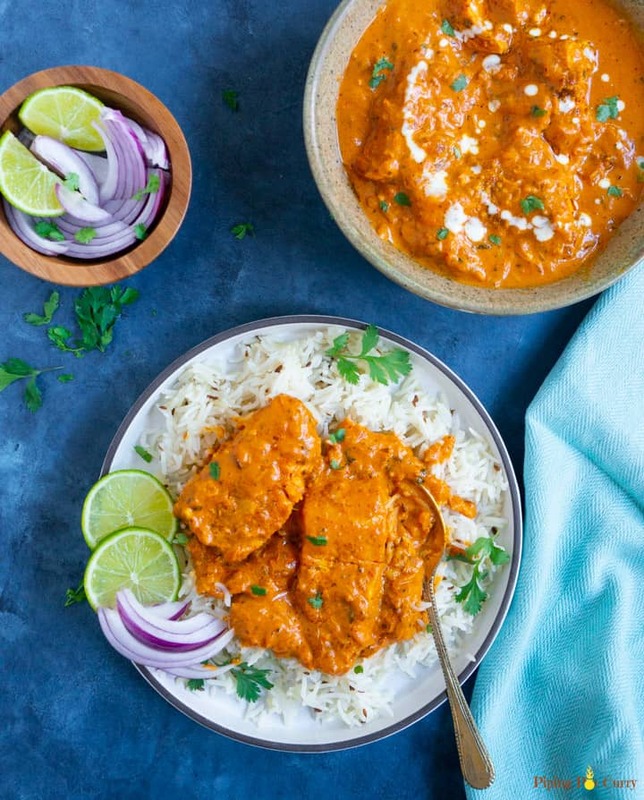 This Instant Pot Salmon Tikka Masala is super flavorful, warm and creamy, perfect to satisfy those curry cravings. Marinated salmon steamed along with tikka masala sauce in the pressure cooker. Serve over basmati rice or enjoy with naan for a scrumptious dinner! Reprinted with permission from The Essential Indian Instant Pot Cookbook, copyright © 2018 by Archana Mundhe. Published by Ten Speed Press, an imprint of Penguin Random House LLC. Since using the instant pot, I have shared lots of chicken and lentils/beans dishes, including this Chicken Tikka Masala. I shared this delicious Coconut Shrimp Curry, but I have been wanting to share more fish curry recipes on the blog. 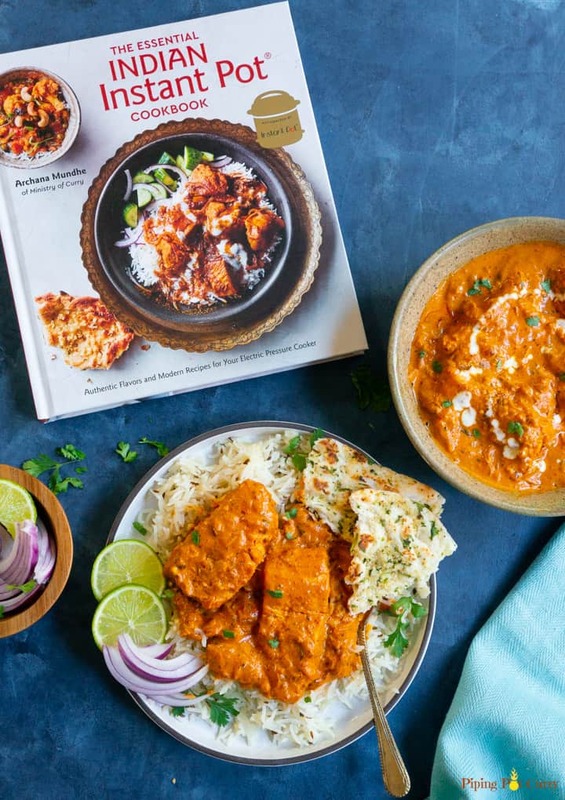 When my friend Archana Mundhe’s new cookbook The Essential Indian Instant Pot released and she offered me to review and share a recipe with you all, I wanted to share this delicious Salmon Tikka Masala recipe from her book. It is finger licking good, and hopefully gives you an idea of the tried and tested easy recipes in the book. The book is absolutely gorgeous with 75 Indian classic recipes including a variety of breakfast, chicken, lamb and vegetarian curry’s, dal’s, soups and sweet treats. The book is wonderfully photographed and will be a great resource for Indian cooking with the instant pot. It has detailed instructions with each recipe, so is perfect for novice or expert instant pot cooks. I highly recommend it, do check it out! 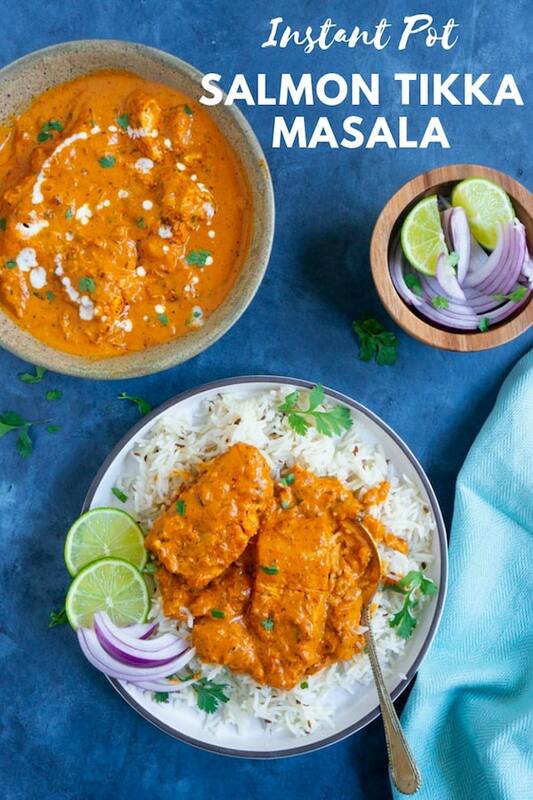 Back to the Salmon Tikka masala, this Indian fish curry made in the flavorful tikka masala sauce is perfect to satisfy those Indian curry cravings. We loved the curry, including my very picky daughter gobbled it up. Can you cook fish in an instant pot? Of course yes! The fear that most have is that instant pot will overcook the fish. The trick is to use larger pieces and steam the fish with the pot-in-pot method in the instant pot. 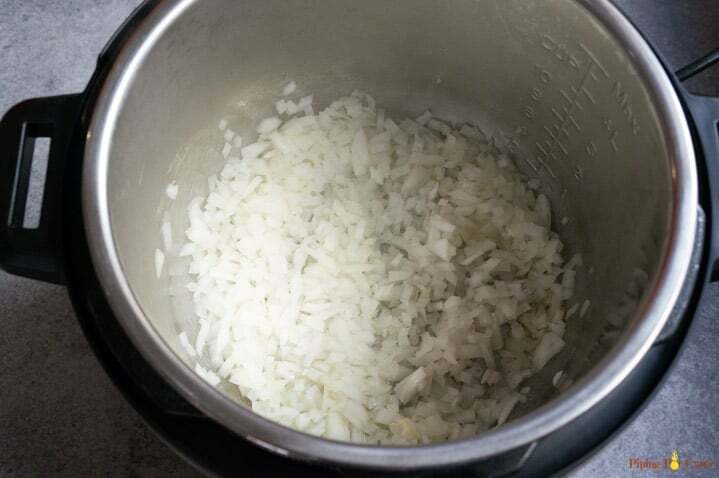 √ Can be cooked along with the curry or steamed vegetable at once for a full meal. √ The biggie…no fish smell in the house. 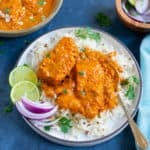 How to make Instant Pot Salmon Tikka Masala Curry? 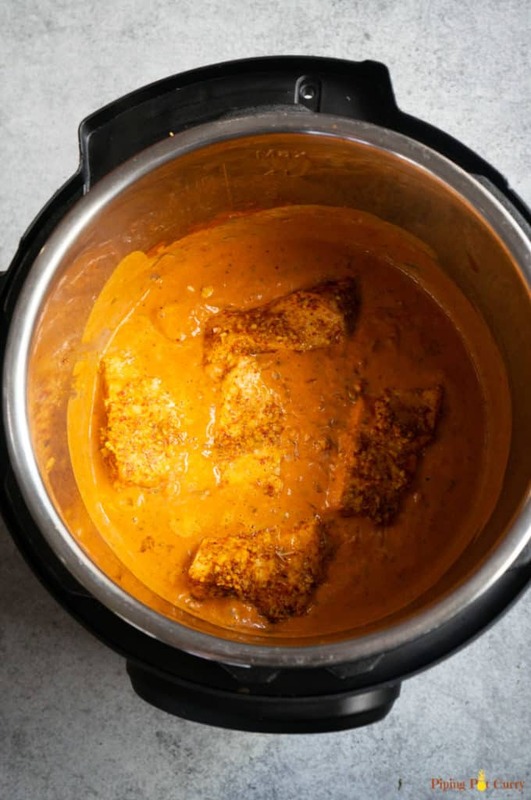 Let’s go through how to make this easy Salmon Tikka Masala in the Pressure Cooker. Before you start, gather the ingredients. Making a curry is so much easier if you have all the ingredients ready at hand. The first step in a tikka masala recipe is to marinate the fish. This is the main difference from a Makhani (or Butter Masala) recipe where marinating is not required. We will marinate the fish in ginger, garlic, lemon juice and spices. Marinate in a steel or oven safe glass bowl that you can use for pot-in-pot cooking. Here is the link to the pot-in-pot container I use. I always prefer to buy wild-caught Alaskan salmon. Farmed salmon can be exposed to more chemicals than the wild-caught variety. Typically, wild salmon have fewer calories, saturated fat and vitamins A and D than farmed salmon but contain more protein. For this fish curry, I bought fresh wild caught salmon from Whole Foods. Now we will start making the curry. Start with sautéing the onions, then add the tomato puree and spices. Can I use fresh tomatoes for the tikka masala sauce? Yes, one can of tomato puree is about 5-6 tomatoes. 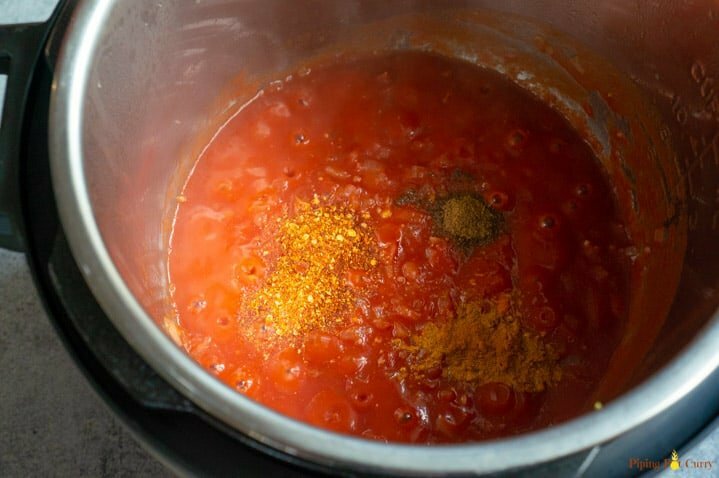 You can blend the tomatoes to a puree consistency and use them for this tikka masala sauce. Now place a trivet and the steel bowl with marinated salmon in the pot. You will need to use a tall trivet, so the steel bowl does not sink into the curry. How do you steam fish in an instant pot? The above picture shows how you can steam fish with the pot-in-pot method in the instant pot. I used marinated fish, but just fish with salt and pepper would work too. How long to pressure cook salmon? With the pot-in-pot method, 3-4 minutes at high pressure works perfectly to cook salmon in the instant pot. After the pressure cooking is done, quick release the pressure. Carefully remove the steel bowl and trivet. I use these tongs to remove the hot bowl and trivet. Oven mitts will work too. Stir in the heavy cream and dried fenugreek leaves. Then carefully pick the pieces of salmon and add them to the curry. Gently stir and cover them in the sauce. Don’t forget to add any leftover liquid from the bowl in which you cooked the fish to the curry. Salmon Tikka Masala is ready. While serving, garnish with cilantro. Enjoy with naan (we prefer garlic naan) and cumin rice. √ Do not skip marinating the salmon. It lets the fish soak in the flavor of the spices and cooking in it making it much more delicious. 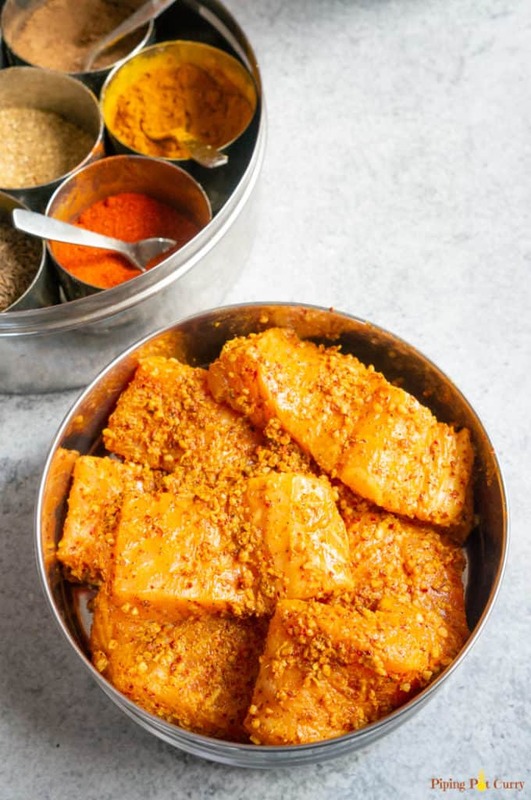 √ You can make this curry with other fish fillets too. √ To make this dairy free, you can use coconut milk in place of heavy cream. √ Enjoy this fish tikka masala with steamed basmati rice or cumin rice (my preference) or with naan. Drizzle some lemon juice when serving. 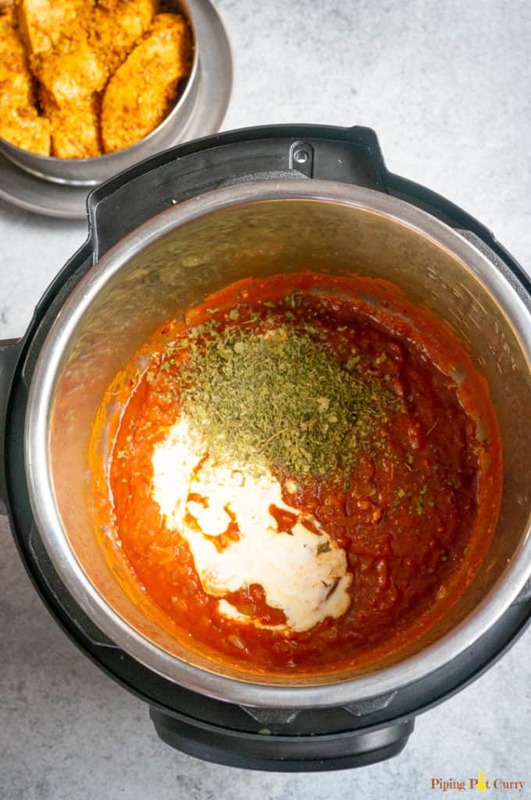 I hope you try this recipe and don’t forget to check out the wonderful book The Essential Indian Instant Pot. Tikka masala combines two iconic Indian dishes: makhani and tandoori. It is essentially tandoori-spiced meat in a makhani sauce. And it turns out that making it in the Instant Pot is so much easier and just as tasty as making it on the stove. Salmon holds up to the layers of spice and retains its shape in the sauce. A splash of heavy cream rounds out this sharp and spicy curry. 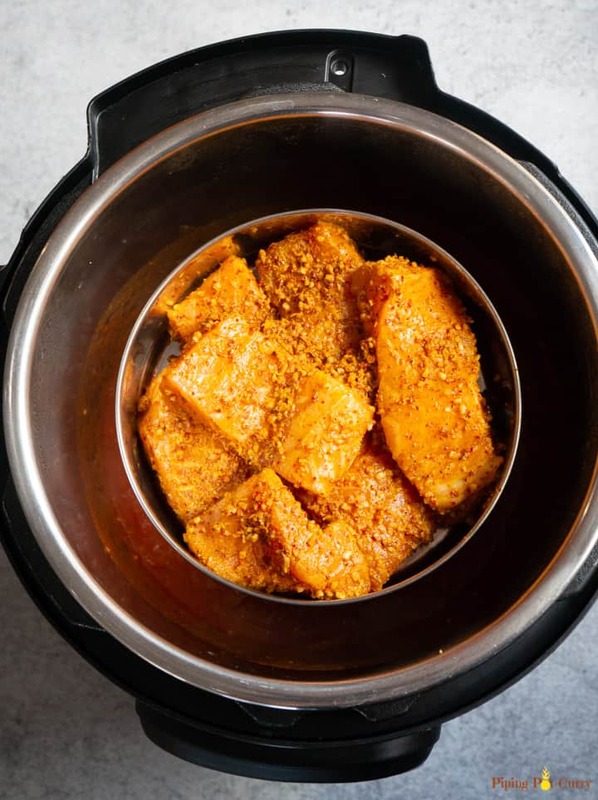 In a stainless-steel bowl that will fit in the Instant Pot, combine the lemon juice, ginger, garlic, chili powder, garam masala, turmeric, and salt and stir to mix. Add the salmon to the marinade and turn to evenly coat with the spices. Set aside. Select the high Sauté setting and heat the oil. Add the onion and salt and sauté until the onion turns translucent, about 5 minutes. Cover the pot with a glass lid (or other nonlocking lid that fits) to speed up the process. Add the ginger and garlic and sauté until aromatic, about 1 minute. Add the tomato puree, chili powder, turmeric, and garam masala. Press the Cancel button to turn off the Instant Pot. Pour in the water and stir well with a wooden spoon, nudging loose any browned bits from the pot bottom. Place a tall steam rack in the pot, making sure all of its legs are resting firmly on the bottom. Place the bowl of salmon on the rack. Secure the lid and set the Pressure Release to Sealing. Select the Pressure Cook or Manual setting and set the cooking time for 4 minutes at high pressure. Perform a quick release by moving the Pressure Release to Venting. Press the Cancel button to turn off the Instant Pot. Open the pot and, wearing heat-resistant mitts, remove the bowl of salmon to a trivet and remove the rack. Stir the heavy cream into the curry, then crush the fenugreek leaves with the palms of your hands to release the aromas and stir them in as well. Select the high Sauté setting and carefully add the salmon to the curry, turning it to evenly coat. Cook until the curry comes to a gentle boil and is heated through, 2 to 3 minutes. Press the Cancel button to turn off the Instant Pot. Spoon the curry onto plates and serve the rice, naan, and lemon wedges alongside. Make it dairy free: Use coconut milk in place of heavy cream in this curry. Serving: Serve with naan and/or basmati rice. Hi Meeta – I made this recipe tonight and was perfect. My family loved it. Thanks for sharing. So glad you enjoyed it Anushree. Thank you for sharing back your review! what if I don’t have the container to put inside the IP for the salmon? Can I bake the salmon in the oven? Hey Sara – Sure, you can always cook the salmon in the oven or a pan, then add it to the curry. Hope you enjoy it! Worked out great! I did double most of the spices because I wanted it to be a bolder taste and less cream but other than that – it was a great, easy, weeknight dinner recipe that I will use again! Hey Ami – Glad to hear you enjoyed the salmon curry. Thanks for sharing the changes you made to the recipe! Should the salmon be marinated overnight? Hey Neha – I just marinate the salmon right before I start cooking in the instant pot. If you want to do it before, I would say 30-60 mins is enough time for salmon. Hope you enjoy it! Was the skin on salmon removed? Hey Minal – yes, I got the skin removed for this tikka masala. Hope you enjoy it! Hi, thanks for the recipe! Do you cook the salmon in the PIP container without adding any water inside the container? I am just looking to cook the salmon and eat it for protein (like tandoori chicken). Would it be good if I marinated the salmon, cooked it in the PIP container without preparing curry? Hey Aswin – Yes, that would work perfectly. Just add 1 cup water in the instant pot steel insert, and cook the marinated salmon in a steamer basket or pip container. Thank you for the recipe. I usually cook fish on low for 8 minutes and then use quick release. But it turns out touch and rubbery. I cook for 7 mins and it’s under-cooked. I don’t know what I am doing wrong? Don’t know how a fish in tin cans is so soft? Hi Sam – Did you try with skinless salmon? We are cooking on high pressure here, so it would be equivalent to low pressure for double the time. We also marinated the fish which makes it cook faster. I would love to hear how it turns out.